We were visiting our friends for ‘Golu’ (the South Indian Dusshera/Navarathri festival) last evening. Our host, Janaki, complimented her husband Sabesh’s remarkable patience in creating a fabulous theme and design for their ‘Golu’ year-after-year. “It is believed in our family that when God distributed patience, Sabesh was the only one around,” she gushed! Why is it that some people are extremely patient while several others are simply impatient? 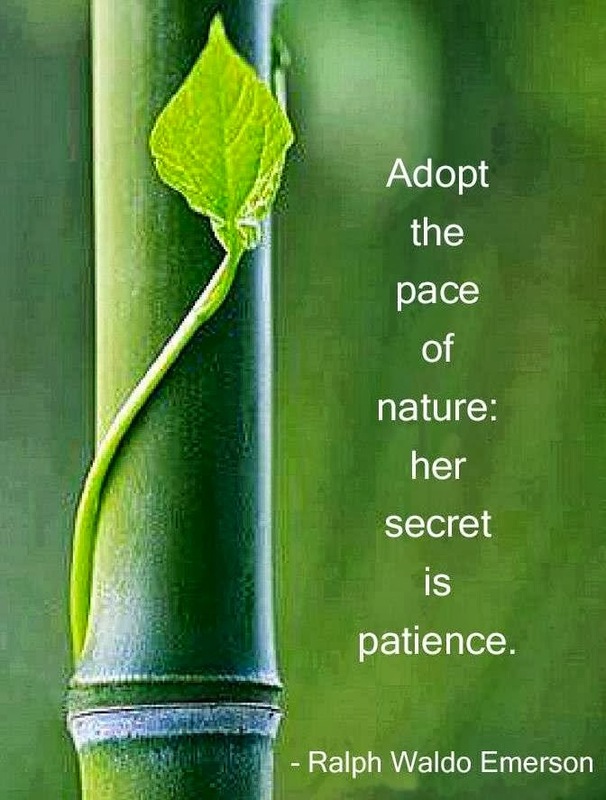 Is patience a virtue we are born with or is it something that you can develop, over time, with practice? I was impatient with Life too, once upon a time. My first boss, my News Editor K.V.Mahadevan, at the Indian Express, 25 years ago, even wrote about me, well – not so glowingly, in his weekly column back then: ‘AVIS is a man in a hurry!’ Over the years of growing up, I have come to realize that patience is something that comes with a deep understanding of Life. You are impatient only when you think you are in control. That you are causing the outcomes of all your efforts. That you are at the center of your Universe. With our busy schedules and our Things To Do lists, we have all become so habituated to getting things done! The truth about Life is it is not ‘a thing’. So, it cannot be done. Life simply happens. You cannot get done with Life. You have to live it. And Life happens at its own pace, in its own time. Patience arrives when you discover that the whole Universe, the cosmos, is at your center, within you! You become patient when all the passion within you converts to compassion, to a deep-felt loving for all creation – when you are soaked in gratitude for the opportunity that this lifetime offers you. Simply, being patient means just being. Be forever grateful for what has happened in your Life so far and be witnessing the happening, the unfolding of Life in the present. Patience is about letting Life happen, waiting expectantly, with curious eyes, with a deep longing, with love! But the human mind will try to hoodwink you. It will convince you that this has not happened in your Life, or that, and will drive you nuts. So, patience is really the outcome of your ability to outwit your own mind. I have learned to tell my mind to shut up and accept what is. It’s not easy. Because the mind is like a monkey – it will keep wanting what you refuse to give it, again and again. But, nevertheless, it is simple – you have to keep on telling the same thing until you tire your mind out into submission. Practising daily silence periods, mouna, or mediation greatly helps. Because when you are silent you can hear the voice of your soul that is telling you to let go, to stop clinging on, to stop demanding, and allow Life to happen to you. You too can sample patience. Here’s a Trial Offer! This Monday morning as you navigate your way to work through rush hour traffic, stop complaining. Just let the traffic happen. Go with the flow. Don’t curse anyone or anything. Don’t honk. Don’t cut lanes. Simply go with the flow. Feel how fresh you are when you arrive at work. If you can feel that energy in you, be sure, patience has arrived in your Life too. That’s all there is to it – patience is letting Life – well, traffic, in this case! – happen and not demanding that it get done!